Tonight we both arrived home at the same exact time. As we were both starving we didn't have time to make anything too elaborate so that's why we turned to my old standby: the Italian Sandwich. We started off with this Cacio de Roma from Italy. 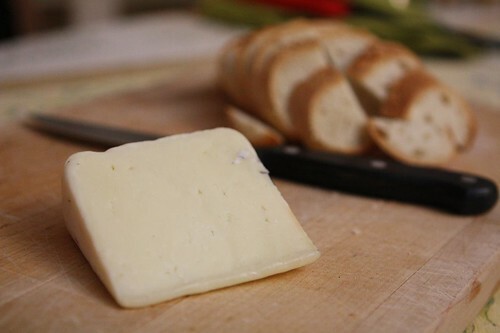 This is a sheep's milk cheese that is bathed in salt water for 24 hours. The cheese that is. Or maybe it's the sheep that bathes in the salt water. I'm just not sure what that does to the wool. I'll need to do a little more research. 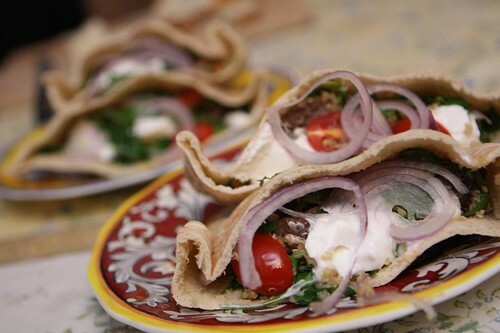 For the main course I took all of last night's leftovers and made them into these pitas stuffed with some of the venison kebabs, quinoa, arugula, red onion, tomato, and yogurt. I was going to serve them cold but since Jen had spent all day in the cold watching marathoners do their marathoning I agreed to heat it up which worked surprisingly well. 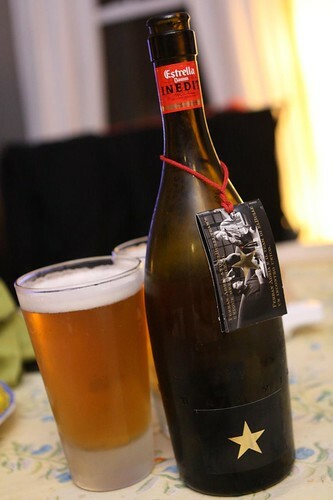 For a drink I poured this Estrella Damm Inedit. This beer is from Italy and claims to be the perfect beer for pairing with food. Unlike last night I missed the opportunity to serve this in wine glasses. That's really not like me. I'm generally very good at taking every opportunity to be a jerk when it comes to unnecessarily elaborate ways of serving beer. This beer features a little booklet that hangs around the neck and goes on for pages and pages about how great it is, what the tasting notes are, etc. It doesn't, however, list its ABV percentage or IBUs. If beer comes with a book that book should at least have the decency to give you the vital stats of the beer. There you have it. Tonight was like an Italian Sandwich. That is if you like to name your sandwiches after the bread they're in. For example: a rye sandwich is a sandwich with corned beef, sauerkraut, Swiss cheese, and Russian dressing. I'm turning the sandwiching world on its ear.